Amazon frogbit (Limnobium Laevigatum) is a kind of aquatic plants of Hydrocharitaceae family. 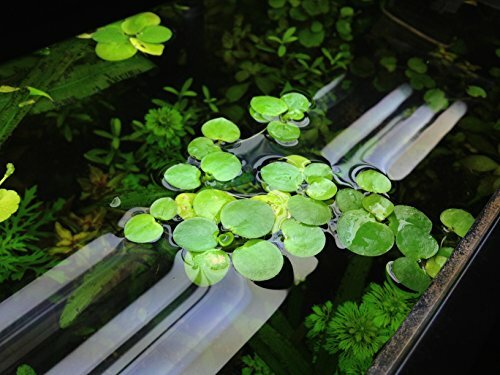 This is a popular undemanding floating tank plant with round glossy leaves. Provided with proper conditions it can cover all the tank surface with its leaves. In this case you should remove excessive amount of plants. Amazon frogbit has fibrous roots which perfectly clean tank water from suspended matter. Due to its unpretentiousness the plant is rather widespread among aquarists. In home tanks you can make it grow uniformly during the whole year round. Scientific name of the kind was fist published in 1814 in the article of a French plant biologist Louis Claude Marie Richard in the 12th issue of Mémoires de la Classe des Sciences Mathématiques et Physiques de L’Institut National de France. The name originated from Greek word λιμνόβιος, limnóbios — ‘dwelling in a lake’. Natural habitat of the kind is on South-East of the USA (its northern boarder – Illinois, Indiana and West Virginia) as well as Central America and North part of South America. Amazon frogbit was brought to California, where it spread rather wide by pushing out local aquatic plants. In ecology this kind is expanded in ponds and bogs with lentic or slowly flowing water. The plant stands temperature drop up to ground frosts. Amazon frogbit lamina is round or egg-shaped sometimes; the leaves are 1,5-3 cm long and up to 0,5 cm thick. From above the leaves resemble coins, but if you look closer, you’ll see that their pith is thickened. Bottom of the leaf is porous and absorbing, it looks like a sponge. The plant leaves contain a large number of aerial cameras. Top of the leaf is bright green and it is silvery from below. Developed root system forms thick hanging bunches. The roots may grow very long if compared to the remaining part of the plant. They serve not only as a perfect shelter for fish juveniles, but as efficient biological filter as well. The roots capture the smallest organic particles and other fine organic rubbish; they serve as nutrients for the plant. The plant blossom is thin with elongated petals. Its dioecious or monoecious flowers are either on the same plant or on different plants. The plant has only emersed form. Limnobium laevigatum is quite easy to keep. It grows at almost any conditions and it has high growth rate. Provided with good illumination and sufficient amount of nutrients the plant can cover all tank surface with its leaves. But it doesn’t mean that you can leave this plant unattended. If you put light lamps too close to the plant, they may cause burns and even its death. This is because the plant itself grows above the water surface. Amazon frogbit likes proper illumination, but if the lamps produce heat while working, it may damage the plant leaves. Aggressive large fishes can eat up the plant roots and leaves, so such tankmates are harmful for the plant. Besides, to create optimal humidity level it is recommended to cover the tank. However, Amazon frogbit can successfully grow in open tanks as well. Amazon frogbit is comparatively undemanding in terms of temperature conditions. It can be kept in tropical and moderately warm tanks at temperature from 20 to 30 °С. In colder water the plant grows sufficiently slower and the plant gets smaller. In soft water Amazon frogbit grows a bit better, than in hard one. Preferable water hardness shouldn’t exceed 10 – 12°, violent water reaction isn’t significant. Amazon frogbit like most floating plants requires high illumination level, though it can stand short-time shading. At natural light especially at sunlight the plant looks the most beautiful and reaches it maximal size. It can show satisfactory growth rate at artificial light as well; LED or luminescence lamps are used for this. It is not recommended to use incandescent electric lamps for this purpose, since they may burn the leaves. Light day should last at least 12 hours for the plant. In a community tank provided with regular water renew it doesn’t require mineral feed. Hanging straight roots of Amazon frogbit don’t need a substrate, that’s why its characteristics are not significant for the plant. It gets all nutrients and mineral feed from water. The plant easily and quickly reproduces in a tank. Buds occasionally appear at the end of its short spurs. Gradually small leaves and fibrous roots grow from the buds. When there are more than three leaves on it, the bulbil is ready for separation from its parent plant.